It's an easy, two-step process to download any CAD drawing in DXF format to your Lowrance GPS receiver with ExpertGPS Pro. Take any ACAD file and create gps waypoints and tracklogs from your CAD drawings that you can send to any Lowrance GPS receiver for use in the field. ExpertGPS Pro imports your CAD drawings in DXF format and layers them over seamless aerial photos or USGS topo maps. You can send CAD lines and points directly to any handheld Lowrance GPS receiver and print reference maps of your job sites. 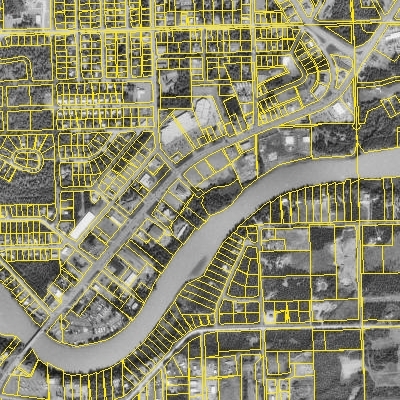 In this example, ExpertGPS is displaying parcel data for Soldotna, Alaska, which was imported from a DXF file. ExpertGPS reprojected the CAD drawing from Alaska State Plane Coordinate System, Zone 4, NAD27 (US Survey Feet) to UTM, NAD83 (Meters) so that it could be viewed over an orthophoto of the city and river. Now that the data is in ExpertGPS, individual parcels can be selected and sent to any GPS receiver, making it easy to locate the property boundaries when working in the field. 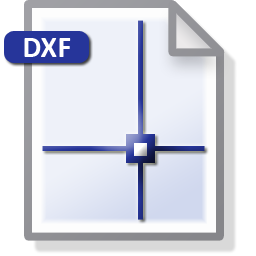 The best way to transfer AutoCAD drawings or other CAD data to your Lowrance GPS receiver is to import your DXF into ExpertGPS mapping software, using Import on the File menu. You can then click Send to GPS to download your DXF data to your Lowrance GPS receiver. ExpertGPS Pro automatically reprojects your drawing from UTM, state plane coordinates, or any other projection into your Lowrance GPS receiver's native format (latitude and longitude in WGS84 datum) and creates waypoints and tracklogs to guide you out in the field. ExpertGPS gives you the ability to quickly transfer site plans and other engineering drawings to your Lowrance GPS. With ExpertGPS, you'll be able to update features by marking GPS waypoints on your next site visit and uploading your Lowrance GPS data back to your CAD software.